MMS JULY 2018 76 mmsonline.com WORKFORCE DEVELOPMENT career path. We also invite the girls and their parents/mothers to our facility to experience how interesting and 'clean' a job at Grob can be." At the modern and bright training area, which is about 5,000 square meters, the young people are trained to become machinists, mechanical engineers, electricians, information technology (IT) specialists, product designers or mechatron- ics technicians within 3.5 years. The other option is to apply for a job at Grob via the Dual Course of Study, which offers a combination of practical vocational training in the company and a bache- lor's degree (4.5 years). The company has replicated its apprenticeship scheme in other locations in Brazil, China and the United States, and Mr. Drexel says it is essen- tial to do so in order to recruit people who have the expertise to install, customize and maintain the company's production systems and universal machining systems. While the Bluffton, Ohio location is helpful in terms of customer support, there is not a deep pool of experienced manu- facturing personnel to tap nearby. "Therefore, we established a paid apprenticeship program from the get-go, largely based on our Mindelheim model," Mr. Drexel says. "The program is not as extensive as the one in Germany (it only lasts 2.5 years as compared to 3.5 years in Germany), but it is really the only option to remain competitive. You have to develop your talent in house." 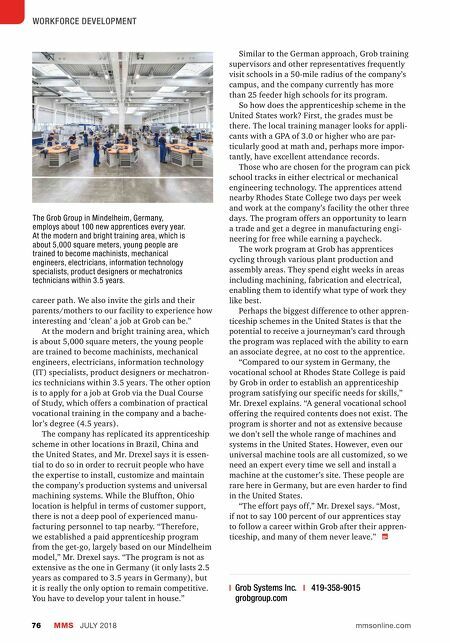 Similar to the German approach, Grob training supervisors and other representatives frequently visit schools in a 50-mile radius of the company's campus, and the company currently has more than 25 feeder high schools for its program. So how does the apprenticeship scheme in the United States work? First, the grades must be there. The local training manager looks for appli- cants with a GPA of 3.0 or higher who are par- ticularly good at math and, perhaps more impor- tantly, have excellent attendance records. Those who are chosen for the program can pick school tracks in either electrical or mechanical engineering technology. The apprentices attend nearby Rhodes State College two days per week and work at the company's facility the other three days. The program offers an opportunity to learn a trade and get a degree in manufacturing engi- neering for free while earning a paycheck. The work program at Grob has apprentices cycling through various plant production and assembly areas. They spend eight weeks in areas including machining, fabrication and electrical, enabling them to identify what type of work they like best. Perhaps the biggest difference to other appren- ticeship schemes in the United States is that the potential to receive a journeyman's card through the program was replaced with the ability to earn an associate degree, at no cost to the apprentice. "Compared to our system in Germany, the vocational school at Rhodes State College is paid by Grob in order to establish an apprenticeship program satisfying our specific needs for skills," Mr. Drexel explains. "A general vocational school offering the required contents does not exist. The program is shorter and not as extensive because we don't sell the whole range of machines and systems in the United States. 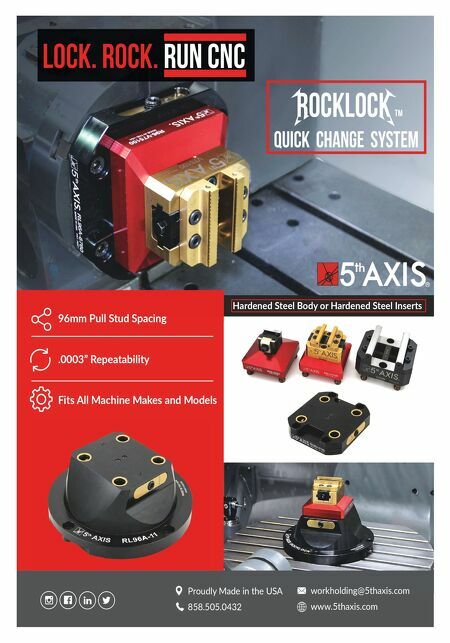 However, even our universal machine tools are all customized, so we need an expert every time we sell and install a machine at the customer's site. These people are rare here in Germany, but are even harder to find in the United States. "The effort pays off," Mr. Drexel says. "Most, if not to say 100 percent of our apprentices stay to follow a career within Grob after their appren- ticeship, and many of them never leave." | Grob Systems Inc. | 419-358-9015 grobgroup.com The Grob Group in Mindelheim, Germany, employs about 100 new apprentices every year. At the modern and bright training area, which is about 5,000 square meters, young people are trained to become machinists, mechanical engineers, electricians, information technology specialists, product designers or mechatronics technicians within 3.5 years.